If the voltage across a fixed resistance is doubled, what happens to the current? This is College Physics Answers with Shaun Dychko. 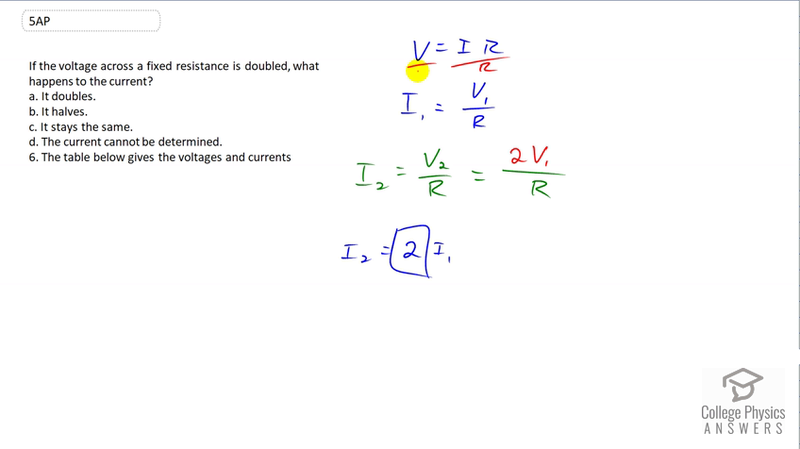 Ohm's Law says voltage equals current times resistance and so we can solve this for current by dividing both sides by R. So we have in the first case in the first circuit, we have current one equals the voltage one divided by R and I did not put a subscript on the R because we're told that the resistance is fixed, so it's the same for both circuits. Now in circuit two, we have the voltage two divided by the same resistance R. But V two we're told is double V one and so I've substituted two V one in place of V two. Now we see that this part is I one and so I two is two times I one. So the answer is A, it doubles.